Longtime Knesset Member and leading hareidi religious Rabbi Menachem Porush died at his home in Jerusalem late Sunday night. Burial will be Monday. Longtime Knesset Member and leading hareidi religious Rabbi Menachem Porush died at his home in Jerusalem late Sunday night at the age of 94. He lost consciousness, and attempts by medics to resuscitate him failed. His funeral will began at 1:30 p.m. (6:30 a.m. EST) on Monday from Kikar Shabbat (Shabbat Square) in Jerusalem to the Har Menuchot cemetery. 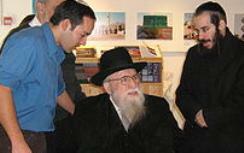 Rabbi Porush, a veteran and respected leader in the religious and political community, was a former Deputy Minister of Welfare and Labor, serving as de facto minister without the full title because of the policy of his Agudat Yisrael and Yahadut HaTorah parties not to occupy full-fledged government ministerial positions. It was revealed in recent years that Rabbi Porush successfully pleaded, in 1994, with then-Prime Minister Yitzchak Rabin not to abandon the holy site to Yasser Arafat’s Palestinian Authority. “Our comfort is that his son Rabbi Meir Porush continues in his father’s ways in the unending struggle for the holy land,” Rabbi Wolpe added. Rabbi Porush resigned from the Knesset for the second and last time in 1994 after serving several terms spanning more than three decades. A native of Jerusalem, Rabbi Porush established Children's Town, as the Children's Day Nurseries, 60 years ago. Children's Town accepted many children who escaped from the Holocaust. He also established Kiryat HaYeled, an educational center for hareidi religious children. He worked as a reporter and later edited the Kol Israel newspaper and served as chairman of the Agudat Yisrael Center in Israel and deputy head of the Jerusalem city council. Photo: Men gather outside the Porush family home Sunday night.